A daily-turned-weekly is looking to sub-let part of its office less than two years after moving there. 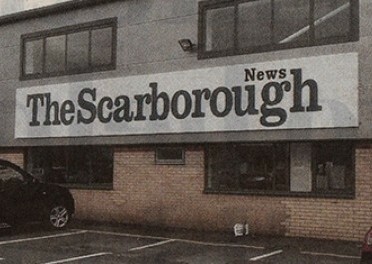 The Scarborough News is offering up a ground floor office suite at its current base at Newchase Court, on Scarborough Business Park. It is understood the building is too big for the News’s current needs, with potential sub-letters being offered the 3,365 square foot offices for £23,500 per annum. The News left its town centre home, at Aberdeen Walk, in September 2014 after 132 years. Its current base, pictured above, is around four miles out of town. The area being sub-let features partitions which have been erected to create a meeting area, a cellular office, server room, store, male and female toilets, shower room and kitchen. It also includes 12 parking spaces and a barbecue area. The sale of the old building in Aberdeen Walk came as part of a bid by owners Johnston Press to raise more than £8m from selling off current and former newspaper offices and ex-print works. In May last year, HTFP reported 21 people had applied for voluntary redundancy at the Yorkshire Weekly Newspapers division of JP, which includes the News. Whatever will the local paper landscape look like by year end. This could be the shot in the arm for the share price Johnston Press badly needs. Currently stuck at 40p (less than 1p pre-consolidation). The share price has not been above 50p since New Year, is a quarter of its value of barely a year ago and with a company market capitalisation of just 25 times its chief executive’s salary. I’m sure the demand for such an attractive building four miles outside Scarborough will be immense. And just think – if it’s “too big” for the paper’s “current needs”, then in a year or two they should be able to rent out even more space as the intern and the part-time assistant will only need a cubbyhole. Looking at the floor plan the building is massive. the upper floor, which it looks like the paper is keeping can accommodate about 80 staff. Makes you wonder why they took both floors to begin with. Perhaps that revenue would help them to rent a smaller office in the town centre……………………………. ?